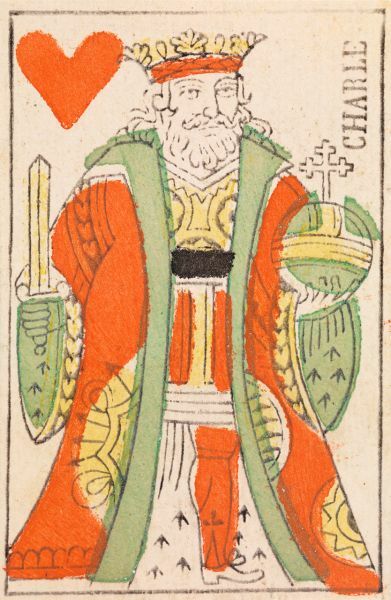 At first glance, playing cards may seem a novel addition to the Baillieu Library Print Collection, yet playing cards are some of the earliest printed images produced in Europe and they convey a world of information about art and society. Piquet is a game rather like euchre which uses 32 cards instead of the regular 52 deck. The set of cards was acquired to provide students of printmaking studies a practical example of the use and application of colour with stencil, but they are also of interest to students of history and psychology. Playing cards are documents of social exchange and they record many fascinating insights about human interaction and moments in history. France has an important role in the development of playing cards and their suits of trèfles (clovers or clubs), carreaux (tiles or diamonds), cœurs (hearts) and piques (pikes or spades) were adopted by many other nations. The design on the piquet set existed briefly at a time when Napoleon deemed that French playing cards be redesigned and stripped of allusions to the former monarchy. He selected a design by Nicolas Marie Gatteaux which instead identifies each of the face cards as a famous person from history or literature such as Caesar, Lancelot and Judith.